Knitting Lesson Plan - A 10 Step-Guide To Knitting Lesson For Beginners. This lesson plan will help guide you through your learning. A lot of time, visitors don't quite know where to start when they come to website. It's all new and confusing to them. This is why I create this page to make it easier for new knitters to get knitting started. 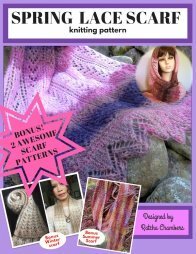 I hope this guide will help you succeed and be on your way to become a Great Knitter! Cheers! Step 2: Go to a craft store and buy a pair of knitting needles (number 8 are best) and a couple balls of medium-gauge yarn. You'll also need a little pair of scissor and a tapestry needle.You can find these supplies at Amazon.com. Step 3: Learn and practice Diffrent types of Cast On techniques. "Long tail" is my most favorite and I highly recommend. Step 4: Practice the "Knit" stitch. Step 5: Practice the "Purl" stitch. Step 6: Practice knitting "Bind Off" or "Cast Off". Step 7: Practice the knitting exercises below. Cast on 40 stitches. Knit all row until you have a square. Bind off all stitches knitwise. Cast on 40 stitches. Row 1 (right side): Knit.Row 2: Purl. Repeat these 2 rows until your piece turn into a square. Ending with 2nd row. Bind off all stitches. Cut yarn and leave 6 inches long tail. Weave the end behind work using tapestry needle. Cast on 24 stitches.Row 1: K1, p1 to the end.Row 2: purl the purled stitches and knit the knitted stitches. Repeat these 2 rows until desired length. Cast off all stitches. Cut yarn and weave the loose end behind work. * Garter Stitch is a pattern made out of knit stitches in all rows. It has a rough surface. **Stockinette Stitch is a pattern that is knitted with a row of knit stitch and a row of purl stitch alternately. It has a smooth looking on the right side. We called the purl (or the wrong side) "reverse stockinette stitch". Step 8: Be familiar with Knitting abbreviations and knitting terms and other types of knitting stitches. Step 9: Find an easy scarf pattern you like and Knit a scarf. Let me know if you needed help (submit your question to me using a form at"Knitting Help Page". Step 10: Increase your knitting skills by practicing easy knitting stitch patterns. You can find many of them at Stitch Pattern Page. Turn them into useful dishcloth or wash cloth. 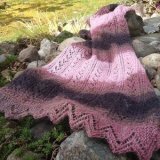 These lesson plan will help you become successful with your knitting. Have fun with it and don't get too serious. If you get frustrated, take a break. If you can't find the answer on this site, search Youtube or sent me a question. I'll be happy to help you. Remember, knitting is all about fun, Enjoy it! I need the simplest instructions for provisional cast on using two needles no waste yarn or crochet hook. What does it mean when a pattern tells you to turn?